Elven Star is a 1990 fantasy novel by Margaret Weis and Tracy Hickman, the second in the seven-volume Death Gate Cycle. Here, Haplo travels to the jungle world of Pryan, where the threat of destruction hangs over the populace. Weis and Hickman give us another interesting (and mysterious) world here, and they do a very nice job of portraying the dread and terror the characters face. The tytans are truly menacing antagonists, which goes a long way toward making the story compelling. Unlike those in Dragon Wing, however, Elven Star’s featured characters aren’t the movers and shakers of the world, and the authors’ focus on peripheral characters makes the book something of a slow starter. Elven Star really stumbles with the romance. While it’s handled competently in some chapters, the book’s prominent love story is rushed over by the authors in its initial stages, which makes it tough to buy into. Moods swing like pendulums, and the reader may roll his or her eyes more than once. Weis and Hickman also grind the gears a bit at the end when shifting to Haplo’s story (the engrossing mystery of what happened to the Sartan, whose fingerprints are everywhere) from everyone else’s (and they get a little preachy about racism, too). Nevertheless, there’s lots going on, and the novel is satisfying enough. Zifnab, Dragonlance’s Fizban imported to the smallest detail, is something of a sticky wicket. His antics and pop culture anachronisms are good for some humor, but his introduction early in the story (and with a dragon, no less) and relatively prominent role amount to, essentially, deus ex machina arriving at the beginning of the book and then waiting around until called upon (those who have read the Dragonlance Chronicles trilogy will see this immediately). Certainly it allows the authors to set plot advancement to Beginner difficulty. 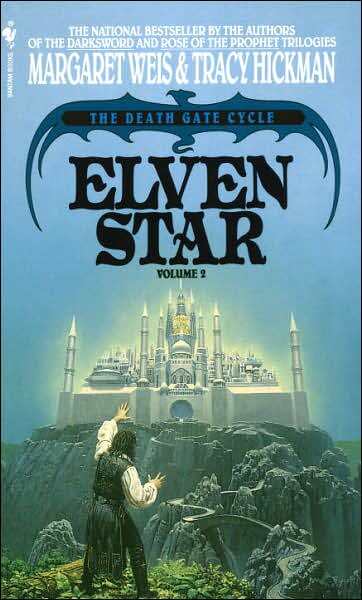 It’s got some problems, but Elven Star is another page-turner from Weis and Hickman set in an imaginative world.